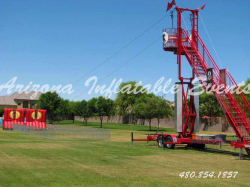 Mechanical rides, inflatable rides or carnival rides we have it all at Arizona Inflatable Events. We offer rock climbing wall rentals, three station rock climbing wall rentals, four station rock climbing wall rentals and our new four station rock climbing wall rental with a three station bungee trampoline rental. Rock walls are a staple for most larger events. Kids and adults all like to climb a rock climbing wall rental. 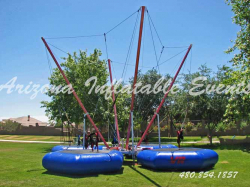 Arizona Inflatable Events also offers bungee trampoline rentals. We have a four station bungee trampoline rental that comes fully staffed at no additional charge. Not sure if you should rent a rock climbing wall or a bungee trampoline rental, well we have the rock wall bungee combo rental. The combo rental includes a four station rock climbing wall rental along with a three station bungee trampoline rental and they come fully staffed. Other rental items include “George” the Dizzy Dragon Spin carnival ride. George as we like to call him is a singe spin ride that requires no power. Having a holiday party try the Trackless Train rental. Arizona Inflatable Events is the only company that has a four car trackless train. The trackless Train rental can hold up to twenty-four children. 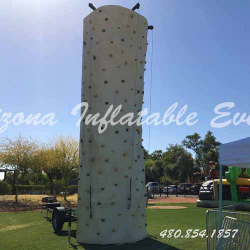 Arizona Inflatable Events is also the only company that provides the Spider Mountain or Spider Zone rental. The Spider Zone Rental or Spider Mountain Rental is a unique ride that allows you to climb through layers of web, really it is just vinyl straps, to the top and slide down the giant inflatable slide. Another fun thing to add to your event is the Mechanical Bull rental. Arizona Inflatable Events offers the Deluxe Mechanical Bull rental. The themed inflatable base is very attractive for any event. An alternative to the Mechanical Bull rental is the Mechanical Meltdown rental. The Mechanical Meltdown rental is base off the popular TV show “Wipeout”. The Mechanical Meltdown rental is great for schools, churches or community events. If you choose the Rock Climbing Wall rental, Bungee Trampoline rental, Dizzy Dragon Spin rental, Trackless Train rental, Spider Mountain rental, Mechanical Bull rental or the Mechanical Meltdown rental you will not be disappointed.